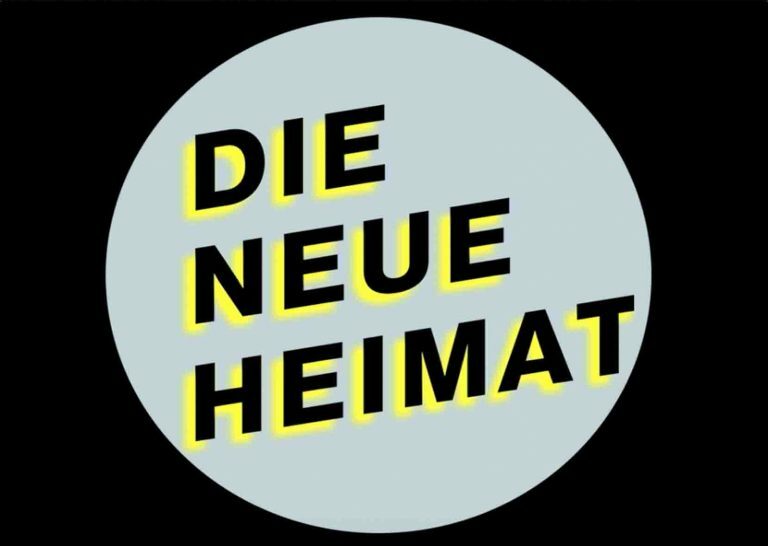 Neue Heimat (1950–1982)February 28 - May 19, 2019, Opening: February 27, 2019, 7 p.m.
‘Neue Heimat’ was the largest and most prominent non-state housing corporation in post-war Europe. 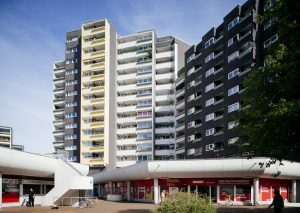 For more than 30 years, the union-led building corporation was responsible for the planning and construction of more than 400,000 apartments as well as, from the 1960s onwards, numerous municipal and commercial buildings in Germany – the majority of which are still standing. 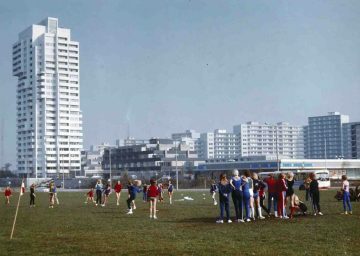 Neue Heimat’s projects not only emerged from a unique interplay between economic interests and politics, they were also an expression and reflection of West German social history. 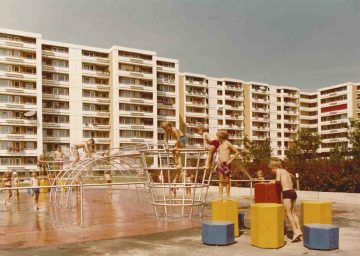 Over the course of West Germany’s ‘economic miracle’, Neue Heimat embarked on a construction programme that successfully articulated the hopes for a better life harboured by broad sections of the population. 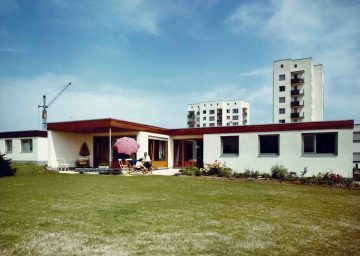 These hopes became concrete reality in the buildings constructed by Neue Heimat, which brought lasting change to the lives of many. 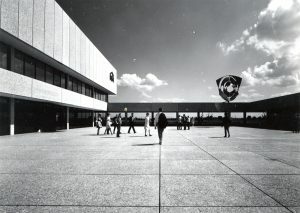 The scandalous collapse of the corporation in the early 1980s sent shockwaves through West Germany and marked the end of an era. 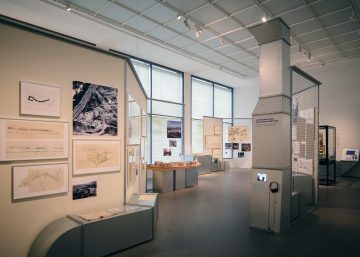 Through noteworthy case studies, as well as numerous historical photographs, film excerpts, plans, and original models, the exhibition now examines and documents the buildings and projects of Neue Heimat for the first time. 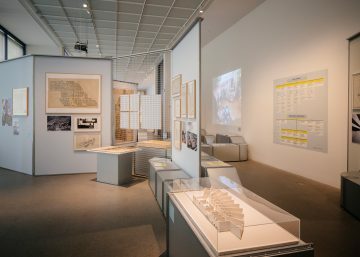 The display includes such large-scale housing estates as Neue Vahr in Bremen, whose place in history was assured following the construction of Alvar Aalto’s elegant residential tower, as well as such ‘showpiece construction projects’ (Demonstrativbauvorhaben) as the ‘Emmertsgrund’ in Heidelberg which were part-subsidized by the federal government to tackle the housing crisis of the 1960s. 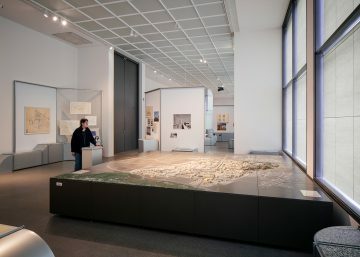 In an effort to counter critics who regarded planned new towns as ‘inhospitable’, Neue Heimat consulted the sociologist Alexander Mitscherlich at the very earliest design stages. 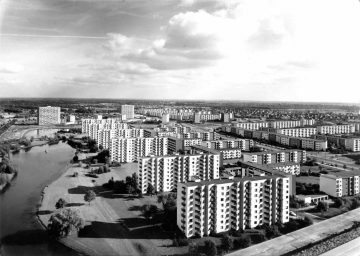 Neue Heimat also embarked on what was then the largest estate project in Europe with the construction of the overspill town of Neuperlach in Munich, which was designed to house more than 80,000 people. 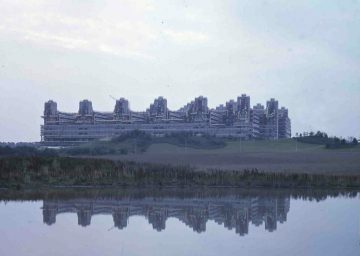 The unparalleled scale of the corporation’s activities is also evident from such gargantuan building projects as the ICC congress centre in (West) Berlin and the Klinikum in Aachen – not to mention an international (although, even today, relatively unknown) portfolio of buildings in countries as diverse as France, Ghana, and Mexico. 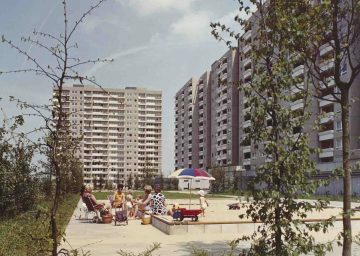 Ever since Neue Heimat was wound up, there has often been an instinctive tendency to dismiss large-scale estates as problematic and undesirable. 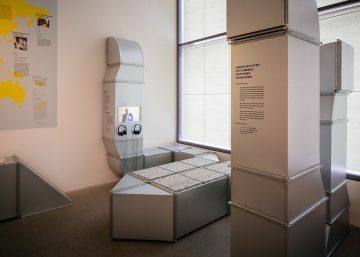 For some time, this attitude has made it difficult to evaluate the corporation’s architectural legacy and social political goals in a nuanced and historically informed manner. 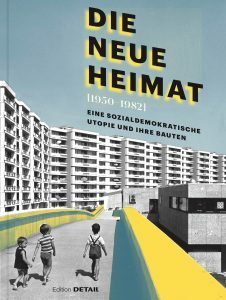 A detailed assessment of Neue Heimat is therefore long overdue: with Germany now experiencing a rising chorus of demands for affordable housing, it has also become clear that cities and local authorities lack any instruments comparable to those available in the era of Neue Heimat to be able to respond to high demand. 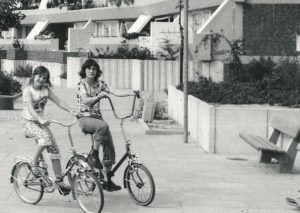 With the benefit of more than a generation’s hindsight, we are now well placed for a critical survey of Neue Heimat: What has become of the – still much touted – Social Democratic vision of a ‘right to housing for all’? 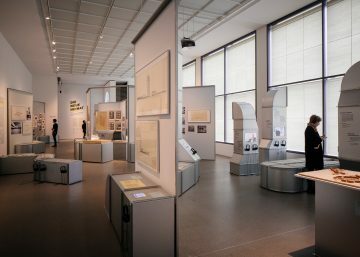 The exhibition features a number of newly produced interviews that document the history of Neue Heimat. 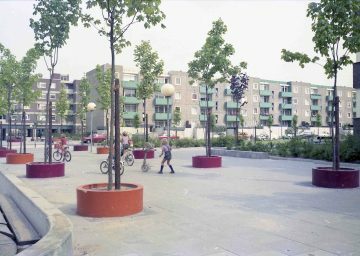 Photographs by Herlinde Koelbl focus on both the residents and buildings of Neuperlach, while Ulrike Myrzik and Manfred Jarisch present a contemporary perspective of housing estates and large-scale projects. 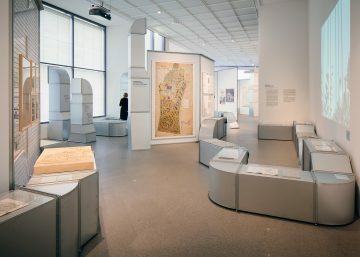 The exhibition is organized by the Architekturmuseum der TUM and the Hamburgisches Architekturarchiv in association with the Museum für Hamburgische Geschichte. 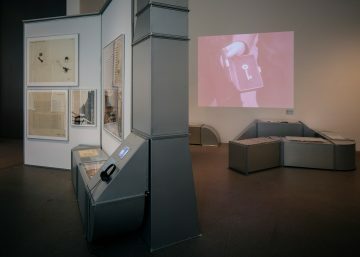 The exhibition will subsequently appear at the Museum für Hamburgische Geschichte (June 27 until October 6, 2019). 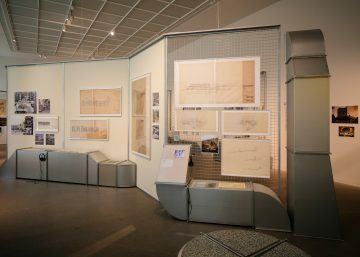 Here you can find the exhibition flyer in english.